It is a given that in order to reshape your body and change your body composition, you must put on some lean muscle. This can mean different amounts to different people but having a good foundation of muscle will help with adding shape, the repartitioning of nutrients for fat loss, energy and health, as well as preventing injury, making you stronger, and helping “tighten up” your body. There are many different styles of resistance training out there. None of them are flat out wrong per se, but very often there is a major factor missing that will hold you back regardless of the method. 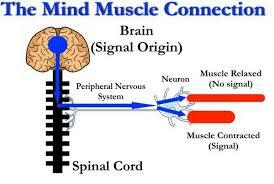 This factor is the mind to muscle connection, the ability to actually create tension in the muscles. Our minds are our most powerful weapons when it comes to our bodies. They must work together to be optimal. To simply focus on dieting, cardio, circuits and throwing weights, is shortchanging yourself from being your best. The ability to focus and work with intent should first be the goal as it will make the more superficial things like losing fat, building a booty, become that much simpler. Control your mind and you can control your body.